If Fleury and her team were feeling any nerves prior to the competition, they did not show in the opening game. 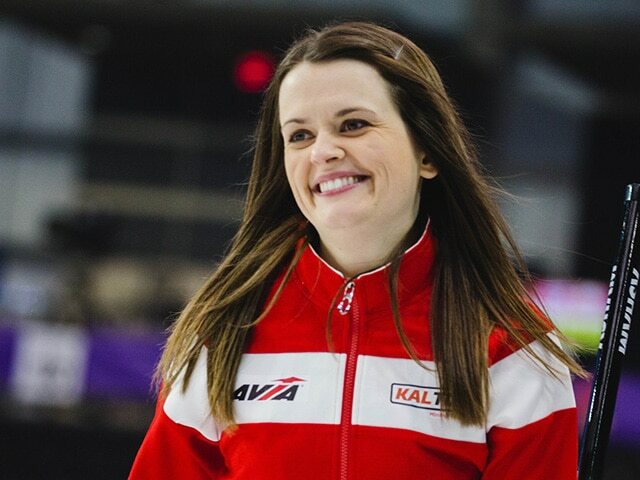 Fleury, vice-skip Selena Njegovan, second Liz Fyfe and lead Kristin MacCuish defeated Alina Kovaleva of Russia 7-5 in their opening round-robin game. Canada started the game in grand fashion. After blanking the first, Fleury orchestrated a score of three in the second end for an early lead. She played a precise back-weight tick shot that nudged the nearly-buried Russian counter stone back far enough for the score. 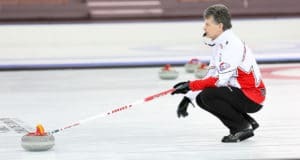 Canada kept Russia to one the following end and added a deuce in the fourth for a big 5-1 lead at the fourth-end break. Kovaleva attempted a comeback in the second half of the game, starting with a score of two in the fifth and steal of one in the fourth putting Russia behind by only one point. But Fleury’s hit for two in the seventh end for a three-point lead put the game out of reach for Russia. 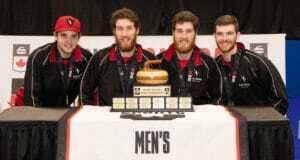 Canada ran Russia out of stones in the final end and forced a score of one. While many of Fleury’s Canadian competitors are at the Home Hardware Canada Cup, she is getting the opportunity to represent Canada for the first time in her career. The debut win was the icing on the cake. “We’ve played the Canada Cup before so we know what that’s all about but this was an opportunity for us to do something new and represent our country and those chances don’t really come very often,” she said. The Canadian women are back on the ice for their lone Thursday game against South Korea’s Minji Kim at 8:30 a.m. (all times CST). Park joined Olympic mixed doubles gold-medallist John Morris at the event in place of Kaitlyn Lawes, who is at the Home Hardware Canada Cup. She was thrown right into the mix with a rematch of the gold medal game against Switzerland’s Jenny Perret/Martin Rios. However, it was the Swiss pairing that captured victory in a 6-5 shootout win. Switzerland opened with single scores in the first and second ends before Canada found its footing. Park and Morris secured two in the third and a steal of one in the fourth for 3-2 lead at the half. Canada kept Switzerland to one in the fifth end and added to the lead with a deuce in the sixth. While Park and Morris were once again successful in keeping Switzerland to one in seventh end they gave up a steal in the eighth, tying the game 5-5. Canada threw first in the shootout and were 18.5 cm from the button. However, Switzerland got its stone 8.7 cm from the button and picked up the win. Park/Morris will get the chance to rebound when they take on Sweden’s Malin Wendel/Fabian Wingfors at 8:30 a.m. on Thursday. 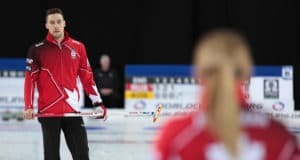 The Canadian men’s team led by Winnipeg’s Jason Gunnlaugson were scheduled to play late on Wednesday night against Scotland’s Bruce Mouat. There are eight teams competing in each of the men’s, women’s and mixed doubles competitions. All teams play a double round-robin within their pools from Dec. 5-8. The top teams in each group move into the finals on Dec. 9. In addition to prize money, the winning teams will earn a berth to the Curling World Cup Grand Final, occurring in Beijing from May 8-12, 2019.